"You Can Survive and Not Survive..."
The overarching topic my English class was introduced to for this year was Conflict. This encompasses interpersonal conflict, political conflict, internal conflict and a plethora of others. 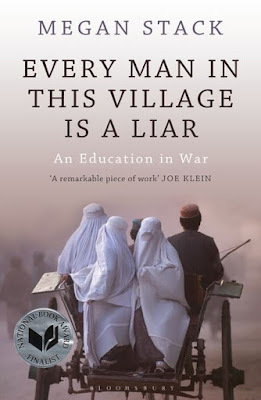 "Every Man in This Village is a Liar" is a novel written by Megan Stack that recounts her time in the Middle East and her perspective on war. Provided with a list of prompts and an itch to write some fictional work, I have decided to post one of the pieces I have written. The product? A narrative about the way the horrors of war can remain with a person. The bolded text are quotes directly from the novel. It was the bloodcurdling scream that jolted her girlfriend awake. As Layla rubbed her eyes and forced herself to sit upright, she noticed Abbey hunched over the edge of their shared bed – her head in her hands as sobs raked her body. She had had a nightmare. Again. As Layla’s eyes began adjusting to the darkness, she noticed beads of sweat speckled on her girlfriend’s shoulders and a damp patch that lined the back of her neck. “Abbey?” Layla whispered. But her voice may as well had been the wind whispering in the night, because Abbey failed to respond. Layla removed herself from the warmth of the doona and padded over to where Abbey sat. Her girlfriend's usually proud and stoic posture was shaking and heaving in an attempt to return her breathing to normal. Layla knelt in between Abbey’s legs and rubbed the faded scars on her knees. She had come to realise these soothing gestures helped calm Abbey somewhat whenever she was in distress. The pink scratches that marred her girlfriend's skin were from the shrapnel of a homemade bomb that had been strapped onto a young boy; it was one of the many nightmares that haunted Abigail's sleep. “Abbey,” Layla cooed again. She knew it was fruitless to force Abbey to open up – she was as stubborn as her partner – but it was still worth a shot. Layla knew if she wanted Abbey to come back to her, she would have to do it on her own accord. As time passed, Layla wondered which memory it was this time. Was it of all the faces of the Taliban Abbey was forced to shoot? Was it the mutilated body parts of the women in her platoon after their truck was blown up? The arms and legs that Abbey was forced to pick up and chuck in a sack before the starved dogs came and ate what remained of her friends. Layla raked her mind for all the possibilities, all the horrific stories Abbey had confided in her on nights like these. She didn’t have to wonder any longer, however, because Abbey finally spoke up. “It was a boy.” Her voice is barely above a whisper, and it would have gone unheard in any other situation. Layla remains silent, not sure if it is her turn to speak, but she lightly squeezes Abbey’s knee to signal that she had heard. To assure her that she is listening. To remind her that she was home – safe. Layla doesn’t recall hearing this story, but she nods all the same, urging Abbey to continue. Layla reaches for Abbey’s right hand when she notices it shaking uncontrollably. She places a kiss on each knuckle, starting from the thumb until she reaches the faint scar across her pinky finger. That one was from her one-on-one combat with a soldier from the Taliban. Tears had stained Abbey’s face by the time she finished recounting her nightmare. “Stop.” Layla interrupts her distressed partner. She couldn’t let Abbey torment herself any longer, not when it wasn’t going to do any good. But that didn’t stop Abbey’s soul from pouring out her conscience. “Sergeant Abigail Barnes.” Layla’s stern voice is juxtaposed with her calming ministrations on the back of her girlfriend’s hand, but it catches Abbey’s attention nonetheless. Before Abbey can protest, Layla spews out words of encouragement, words of love, words of assurance. Layla punctuates each sentence by placing a kiss to the places Abbey’s tears had managed to reach. First each of her eyelids, the apples of her cheeks, her chin, and the junction between her jaw and neck, before cupping her face in both hands. The woman sitting opposite Layla exhales a breath she did not realise she was holding in. Rays from the sunrise begin to seep into the room, but the tension between the couple is still palpable. Then she finally says something that haunts every fibre of Layla’s being.